Every pilot in a cockpit, regardless if he fly’s a commercial Airliner, a modern Helicopter or even the most complex Space Shuttle, uses his hands and feet for interacting and controlling the aircraft. Yoke and Rudder, Cyclic and Collective or the Side-Stick in modern Fly-by-Wire environments: each of this aircraft control elements provide the pilot with a very type-specific and unique feedback in movement and forces. That’s why the ability of a most realistic and precise replication of these physical men-machine interactions is one of the dominant quality factor in modern Flight Simulators. BRUNNER has developed his portfolio of leading Control Loading Systems in close cooperation with experienced pilots and experts from the flight training industry. Our long-lasting and deep experience with modern Drive and Control technologies and our passion for aviation were the baseline and motivation for our product development initiative. The integrated high-dynamic brushless AC Servo technology reacts with realistic movements to even finest inputs and offers artificial feeling that qualifies for professional Flight Simulator applications. BRUNNER defines a new standard for powerful and innovative Control Loading Systems. Our Drop-In Control Loading Systems meet the highest demands and address the full spectrum of flight training applications. Drop-In stands for the full integration of all elements and component’s belonging to the device in only one box. This also includes the Control Unit and Power Supply. As a result, our Control Loading Systems are truly compact and easy-to-integrate Plug & Play solutions that can quickly integrate in any existing or new simulator environment. An intelligent combination of integrated force sensors with high-dynamic drive technology reacts with realistic movements to even finest inputs and offers realistic artificial force feedback. Our portfolio of Control Loading Products supports training applications which range from a simple Desk-Top-Trainer to Flight Navigation & Procedure Trainer and finally reaches professional Full-Flight- and Full-Mission Simulators. Regardless the types of simulator build with our Control Loading products: we always create flight controls that provide precise and realistic flight control feedback to the pilot and therefor support high training values. Finally, all our Control-Loading devices are fully configurable via our software interface. It allows defining and managing aircraft-specific profiles for control movement and forces. All devices easily interface via TCP/IP, CAN-Bus or CAN-Aerospace into any existing or new flight simulator architecture. A very demanding and important key feature of professional Helicopter Simulators is the most realistic and helicopter- specific replication of all movement and force feedbacks provided to the pilots via their Cyclic and Collective controls. BRUNNER has developed dedicated Helicopter Drop-In devices for Cyclic and Collective controls and added a professional Rudder-unit to it. In combination, these Drop-In devices integrate perfectly into new Flight Simulators and lower the total integration and tuning efforts significantly. Furthermore they can act as ideal components for the modernization of worn-out or obsolete simulator components. Our Cyclic and Collective Drop-In Control Loading Systems provide an intelligent combination of integrated force sensors with high-dynamic drive technology that reacts with realistic movements to even finest inputs and offers realistic artificial force feedback. All our Control Loading devices support single as well as dual pilot applications. The optionally available BRUNNER Grips allows for fast adoption to your training scenarios. Enabled by our CLS2Sim software-environment, the devices communicates easily with commercially available simulation software. BRUNNER Simulation Components – that is the title we use to summarize and characterize all those components and technologies that a most vital and enabling elements in modern Flight Simulators. As such, our Simulation Components accompany and connect our Drop-In-Devices. All our Simulation Components integrate easily via TCP/IP, CAN-Bus or CAN-Aerospace and fit into almost any existing Simulator Architecture. Simulation Components by BRUNNER are built upon our innovative industrial electronic components. These industrial Drives and Controls serves as enabling technology and leads to superior simulation components like our Linear Motion. As an active linear control loading element, it adds to our portfolio of Drop-In devices and acts as a drive for original aircraft controls with forces up to 2.000 N.
BRUNNER has developed an all-electrical 6 Degrees-of-Freedom (6DoF) motion platform with a payload of up to 1 ton. This platform will become an interesting and cost-attractive upgrade for our customer’s small-to-medium flight training systems. 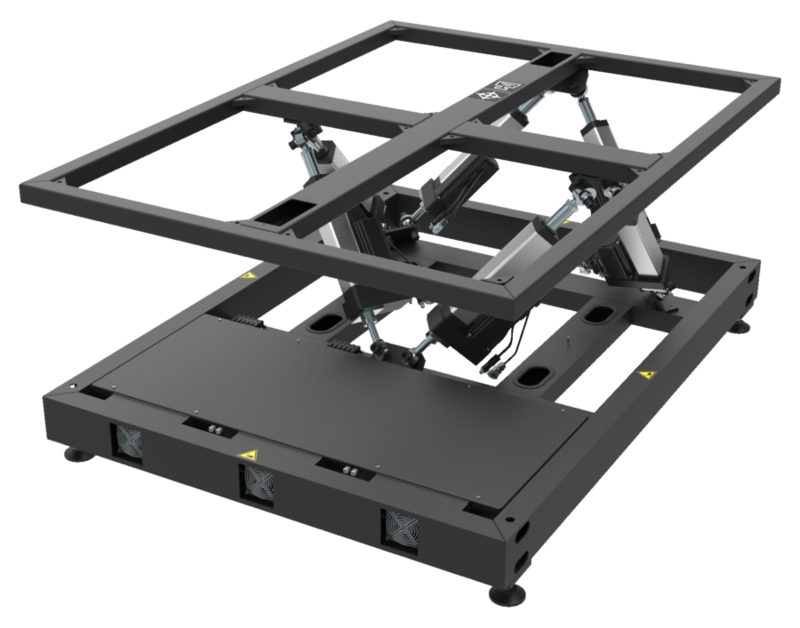 Moreover, our 6DoF Motion Platform can serve many other application areas as well. As an example, it could form the baseline to a low-cost earth-moving machine simulator.